What do you think? Fireworks or dud? Let us know!! I kinda like this. It reminds of William Morris prints (my interior design classes). I think this would be great for those working on heritage but a few of these I would buy just because I love them. I like the vintage feel to them. OMG! I have never seen sooo many UGLY patterns together. This is seriously hideous! I am sorry for people that like these patterns but this looks like a bad trip to the past. The only paper that I 'might' use is the one with the blue background and the white accents (the 9th one from top to bottom) and even that one is a little overwhelming. I better don't keep looking at it so I don't get a headache, but seriously, if this is the 'sneak peek' I wouldn't want to see the rest. A few of these prints remind me of some K&Company papers I have. I really don't care for the floral pieces but I like the smaller designs and the "damask" looking papers. Not too sure about this particular line - it may look better up close. Not sure I like this either...it really reminds me of wallpaper, after struggling to remove it from the walls in my bathroom (!) it's something I vowed I would banish from my life forever!!! I love this. I can't wait to add it to my supplies. I love these. Interesting to read the comments from those who had such a strong dislike for it. To each her own! I don't think they are too good for Independence day pages, but I could definitely see them being used for heritage, or heritage Independence day pages!! Not the best I've seen, but some of it is pretty. 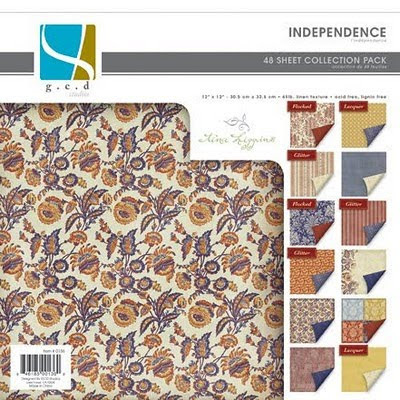 I am not liking the Ella Blue or Indepenence Collections. The colors in the Ella Blue aren't bad, but the patterns are awful!! Overall this line looks good BUT since my 4th of July pictures are usually fun of kids, fun, cookouts, fireworks, etc. I can't see myself actually using this line for Independence day photos.